Klea is at present sixteen years old. She and her family are living in Perrenjas, but she started to attend the high school in Kotodesh. Klea uses the minibus to come to school. She also has her mother coming along with her in the minibus because she works as a teacher in Katjel. Klea attends the second grade high school. Her favorite subject is Mathematic. Her future dream is to be a nurse. Her favorite color is red. Klea attends twice a week, every Tuesday and Friday our feeding programme at Kotodesh, enjoying the combined meals cooked and served to the participating children. She likes the fried chicken, sausages, pasta and rice served by our cooks. Klea attends the Bible classes for the children who are same age with her and enjoys singing to praise the Lord Jesus and learning from God’s Word. At the end of the Bible lesson, she and the other children spend time to play at our feeding centre under the care of our teachers. Klea once a year has the possibility to have a free dental care offered by our dentist. Klea has both parents and a brother who is eighteen years old. Her father is emigrating and working in Greece for six months. Her mother is also hired as teacher. 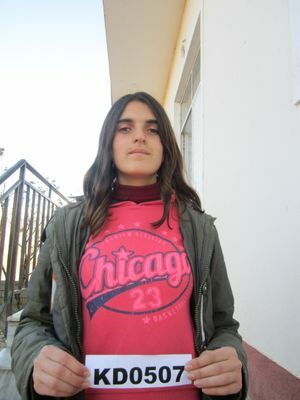 Klea’s older brother has completed school and is trying to find a job but there are very few possibilities for him.